In my need for a change of pace, I found myself craving broccoli salad a few days ago, something that does not happen often at all, except for the odd day midsummer when it sounds good, or when I’m several time zones out of my element, running late for a wedding rehearsal, and my stomach is growling audibly, and I’m standing in front of a deli counter. It happens sometimes then too. I think the craving came this time from seeing a picture of broccoli salad. It seemed so wonderfully opposite of all of the roasted vegetables we’ve been eating. I wanted it. Then I remembered that I had noticed a broccoli salad in my copy of The Smitten Kitchen Cookbook, and that it was high time I give something from that book a whirl. Except that I kind of didn’t make that broccoli salad at all. When the time came, I found I had rather strong ideas of what I wanted from this particular broccoli salad. This included blanching the broccoli first so that it would be tender with only a residual crunch, rather than squeaky and feathery and overbearing, as raw broccoli is wont to be. Also, I wanted bacon. And cherries (because as we know, cherries and bacon are a surprising but fabulous pair). And I wanted toasted pecans for extra crunch. These all seemed like reasonable things to want from your broccoli salad. So I went with it. I also had every intention of making crispy fried shallots to sprinkle on for an oniony element, but crispy fried shallots and I really don’t get on well. I somehow manage to produce incinerated, blackened shallot remnants instead, every time. 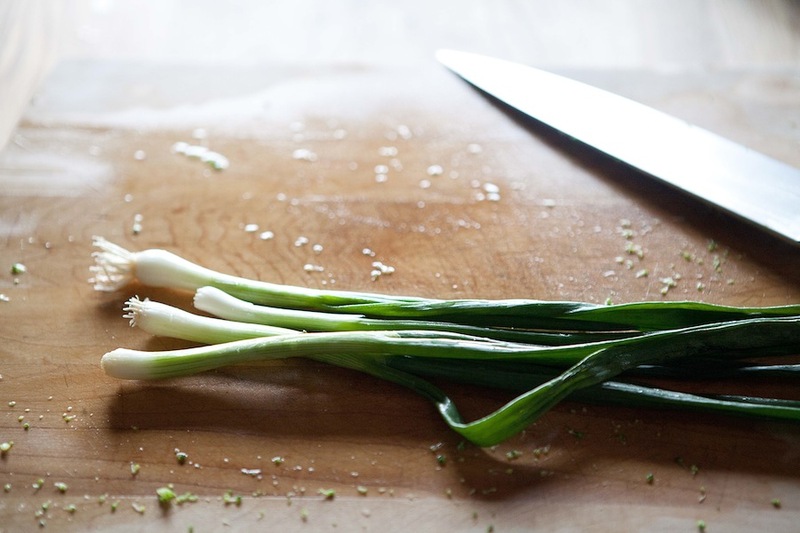 So, I wound up using chopped green onion instead, which turned out to give the salad a lovely whiff of spring. One thing I was definitely keeping, though, was the buttermilk in the dressing. Buttermilk dressing was obviously in order. It seeps into the flowery tops of the broccoli and lightly coats the stems and makes the whole thing tangy and punchy and easy to eat. 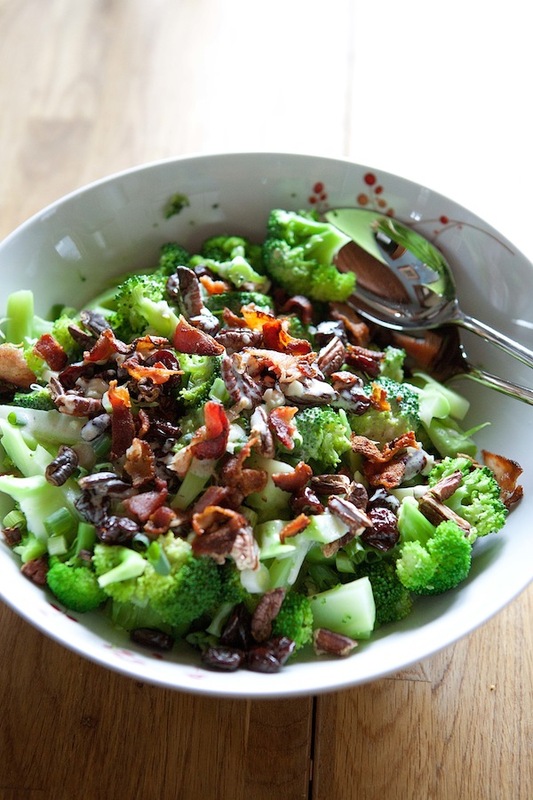 This is a salad where it’s nice to try to get a bit of everything in each bite because the dressing knits together the flavor of the broccoli with the sweet-tart cherries, the nutty pecans, the grassy onion, and the salty bacon. In fact, if you can, make the salad ahead of time and leave it to sit in the refrigerator for a couple of hours (tossing it now and then as you remember), in order to give the flavors some extra time to get to know each other. Toss in the bacon just before serving though. You want it crisp, not soggy. Then, if you need to, you can lay out plates on a checkered table cloth and eat broccoli salad with a nice hunk of crusty bread and pretend you’re having a picnic on a warm, late spring day. I think I may need to. Wash the broccoli and cut the heads off of the stems. Chop the heads into individual florets (not too small yet, though). Chop the bottom, toughest portion off of the broccoli stems, then use a vegetable peeler to peel the stems. Cut the peeled stems into matchsticks. Bring a large pot of water to boil. Add the broccoli to the water and cook it until it is just bright green and starting to get tender, a minute or two. 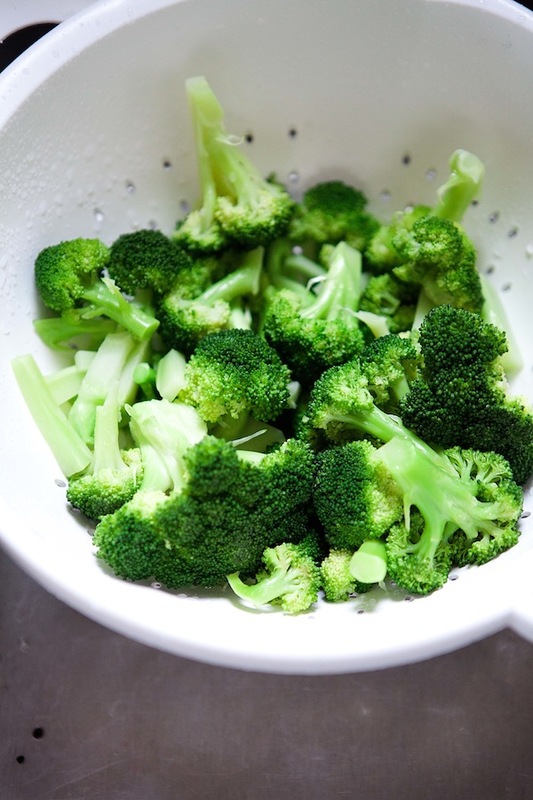 Drain the broccoli into a colander and run cold water over it to stop the cooking. Set aside. Cook the bacon in a medium frying pan over medium heat until it is nicely browned and crispy on both sides. 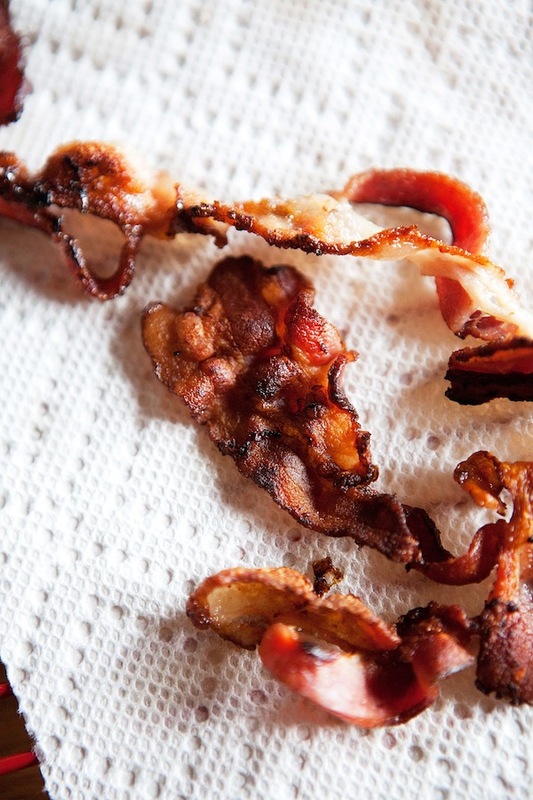 Transfer the cooked bacon to a paper towel lined sheet to drain. (And pour a little of the bacon grease into your dog’s food. She’ll be psyched!). 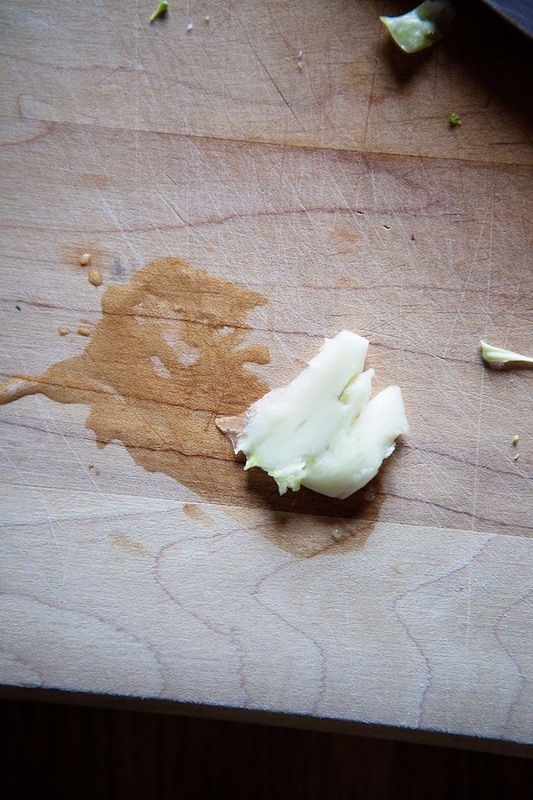 Chop the cooked broccoli into small, bite sized pieces and put it into a large salad bowl. Add the toasted pecans, cherries, and greens onions. In a smaller bowl, whisk together the buttermilk, mayonnaise, garlic, mustard, vinegar, honey, salt, and a good grinding of fresh black pepper. Toss the salad with the dressing. If you’d like, let it sit in the fridge for a couple hours before serving. Or, you can serve it still slightly warm from the broccoli cooking. It’s pretty tasty either way. Just before serving, chop the cooked bacon into small pieces and toss it in with the rest of the salad. Taste and add more salt and pepper to taste. Then, serve! wow, you know that you’ve been friends a long time when you remember the same lion-lamb anecdote from 2nd grade! 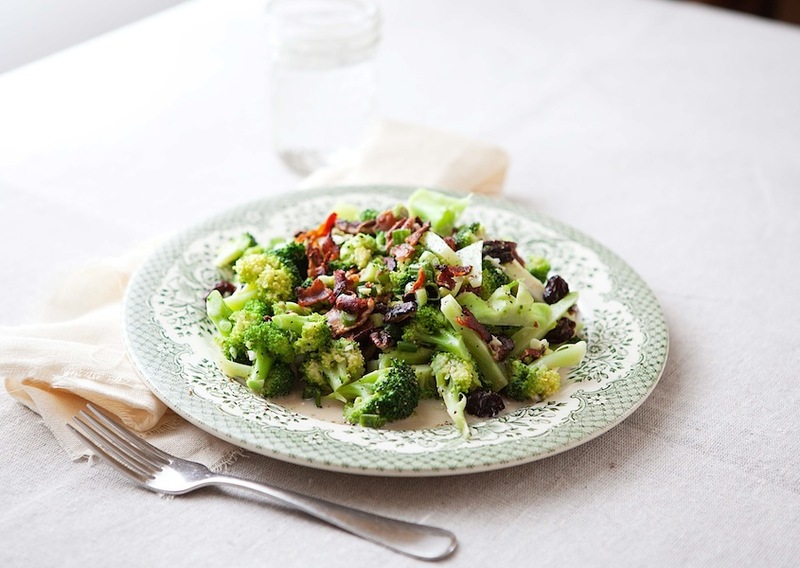 This looks so good and much healthier than the broccoli salad we used to eat with similar ingredients but a much heavier dressing! I love the idea of blanching the broccoli, it gives it a gentler taste! This looks so fabulous! I WANT it for dinner! Absolutely lovely!!! I just made Deb’s broccoli salad — the way she wrote it, more or less — for a cookout this last weekend! I love the coincidence, and your version sounds like a wonderful combination. 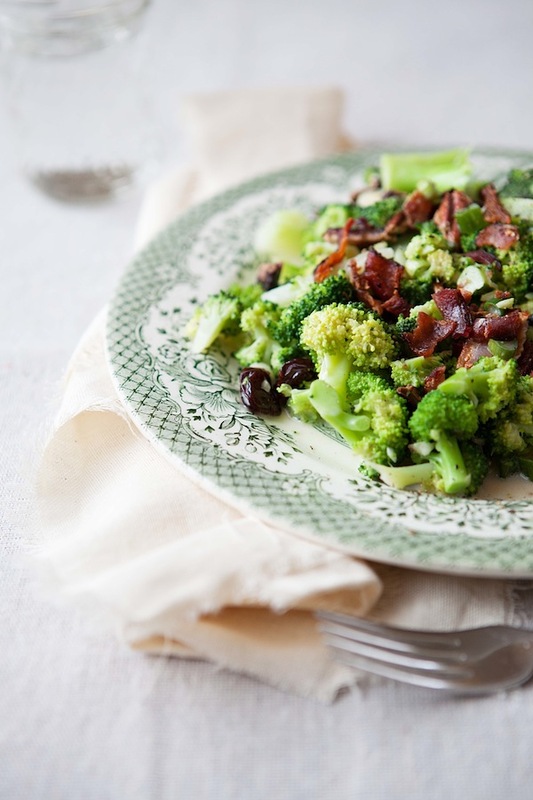 Bacon, yes… And crisp-blanching the broccoli! So clever. Spring is not here, yet, either… it rained a ton yesterday, and froze overnight, and the doors to my pickup were frozen stubbornly shut this morning. However, in a stroke of luck for last weekend’s cookout, the sun shone with all it’s strength for us! How funny! That’s such a coincidence. I’m glad to hear your cookout was sunny. Sounds super fun! Thank you! I hate raw broccoli for all of those reasons, but I adore lightly cooked broccoli. This salad looks fabulous. I may have to make it soon, especially since I have broccoli languishing in the fridge. Hurrah! That’s wonderful to hear! 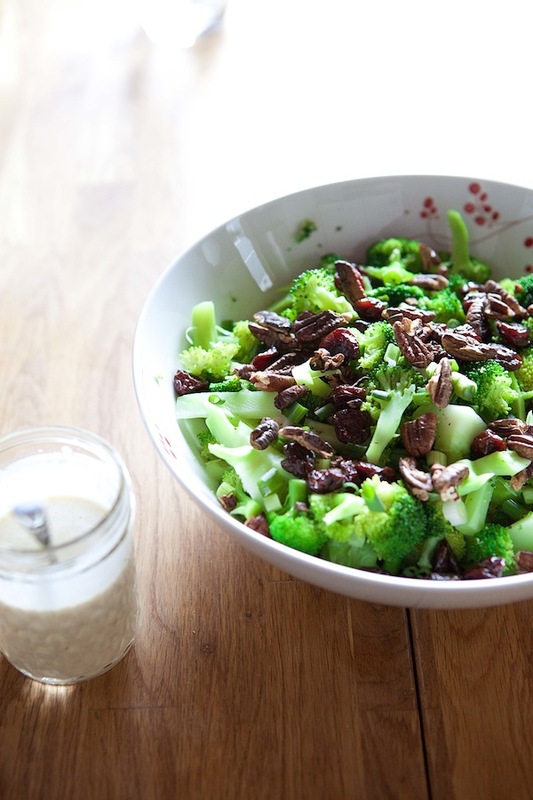 You are currently reading Broccoli salad with bacon and pecans at Five And Spice.